"Thanks very much for writing your book, I have read all of the non-directory sections closely and enjoyed it all. I neve fully understood the detail of the South Sea bubble until now, which is fascinating. The book is a fountain of knowledge and I will always treasure it"
Keith's years of research into the Blacksmiths' Company have uncovered the history of many clock and watchmakers. Contains over 400 illustrations and a directory of over 1,500 clock and watchmakers...many previously unknown. "I have been away and recently returned to find your quite magnificent book. Many congratulations of a fine and fascinating work. It will be of much interest here – particularly the William Clement research. The whole book is beautifully presented." " I’m very pleased with your book, especially the photos ( the clock on the cover is one of my favourites!!)." If you wish the book to be sent overseas to other parts of the world or would like to use a different method of payment, please Contact Us. 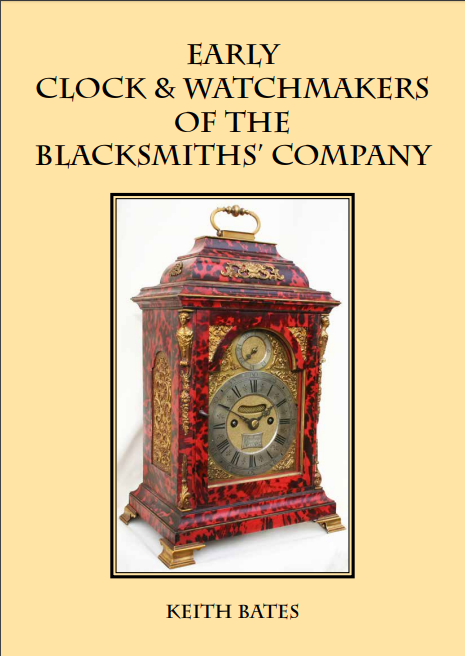 After more than 30 years research into the records of the Blacksmiths’ Company of London, the author Keith Bates has produced an interesting and informative account of the development of the clock and watchmaking trade within that company. In the early 17th century the watchmakers wanted to form their own company in order to control the quality and output of watches but the Blacksmiths’ Company (B.C.) was concerned that it would lose many members and also much revenue. After the formation of the Clockmakers’ Company in 1632 the author follows the struggle between the two companies and explains how the trade continued to develop within the B.C. and shows how it expanded with a number of craftsmen moving to the provinces to trade. Some clockmakers also specialised in supplying clock movements to craftsmen in the Clockmakers’ Company. The author illustrates the work of the leading craftsmen working in the late 16th, 17th and 18th century which included lantern clocks, longcase clocks, table clocks, turret clocks, year clocks and watches. The book comprises 12 chapters covering various aspects of the trade, shows 23 trade descents in tree form, has more than 400 illustrations and contains 490 pages, including a Directory of more than 1500 clock and watchmakers trained in the Blacksmiths’ Company.
" Your wonderful book arrived today in beautiful condition."